The Chicago Botanic Garden is on #TitanWatch. That’s right: if you visit the Garden’s Semitropical Greenhouse, you will see Sprout, the latest corpse flower from the Garden’s collection of 13 titan arums to begin a bloom cycle. Our corpse flowers (Amorphophallus titanum) are now on display in a variety of life stages: in fruit, leaf, and imminent bloom. You might remember Spike and Alice in 2015: Spike failed to bloom but provided so much excitement; and Alice the Amorphophallus brought visitors to the Garden at all hours to see, and smell, a corpse flower in bloom. Now we are all watching Sprout to see if the corpse flower—known as a titan arum (Amorphophallus titanum)— will produce a huge, rotten bloom. Follow the progress of #CBGSprout on our corpse flower webcam and check our website for updates. We learned a lot about corpse flowers in the last few months, and in the Semitropical Greenhouse, there are corpse flowers at three different stages on display: in the middle of a bloom cycle (Sprout); a non-blooming titan arum leaf; and a pollinated and fruiting titan arum (it’s Alice!). The corpse flower is one of the largest and rarest flowering plants in the world. It takes seven to ten years for a single corpse flower to produce a flowering structure (inflorescence). While other corpse flowers in cultivation have bloomed around the world recently, having more than one plant bloom in such a short time is uncommon. Watch for these signs the titan arum bloom is starting. Corpse flowers smell bad. Really bad. Peak stink time is usually very late at night. Speaking of night, that’s when corpse flowers usually bloom. And once they bloom, the bloom lasts 24 to 36 hours. Want a sneak peek? View our last titan arum bloom. If Sprout blooms, the Garden will stay open until 2 a.m. so visitors can experience the corpse flower bloom up close (last Garden entry will be 1 a.m.). Watch the live corpse flower webcam, check the blog (subscribe today), and follow the Garden on Facebook and #CBGSprout on Twitter to get the latest information. Corpse flowers are BIG. In their natural habitats, they can reach 10 to 12 feet tall with a bloom diameter of 5 feet. In cultivation, they typically reach 6 to 8 feet in height, but all are different. Corpse flowers are unpredictable. When the Garden was watching Spike, the first titan arum, even the horticulturists were surprised that the plant did not flower. Corpse flowers are native to Sumatra, but Sprout was grown here from seed the Garden received in 2008 from the University of California Botanical Garden at Berkeley. Learn about the titan arum’s native habitat. The corpse flower includes the corm, which may or may not go on to produce a flower; the spadix, which is the tall flower spike; the spathe, which is a single, frilly, modified leaf that enwraps the spadix; the petiole, which is the leaf stalk; and the branch-like rachis, which supports the many leaflets. 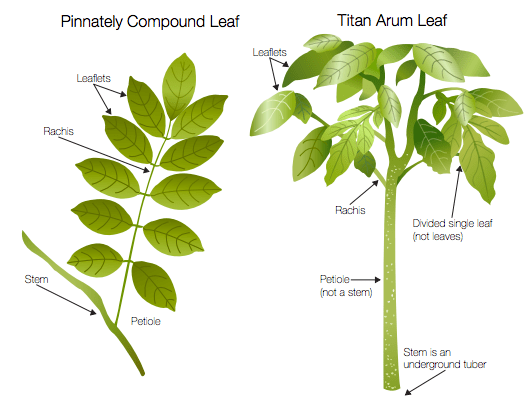 Find more diagrams and information in our titan arum educator resources. Corpse flowers that bloom in the wild attract pollinators like carrion beetles and flesh flies. Once the plant is successfully pollinated, it develops olive-shaped, red-orange berries. Read more about titan arum pollination. Corpse flowers need protection. The Garden’s conservation work ensures that plants like these survive and thrive. Studying seeds from Sprout, Spike, and Alice enables scientists and horticulturists at universities, conservatories, and other institutions increase the genetic diversity of the species. See how we are studying our titan arum fruit. 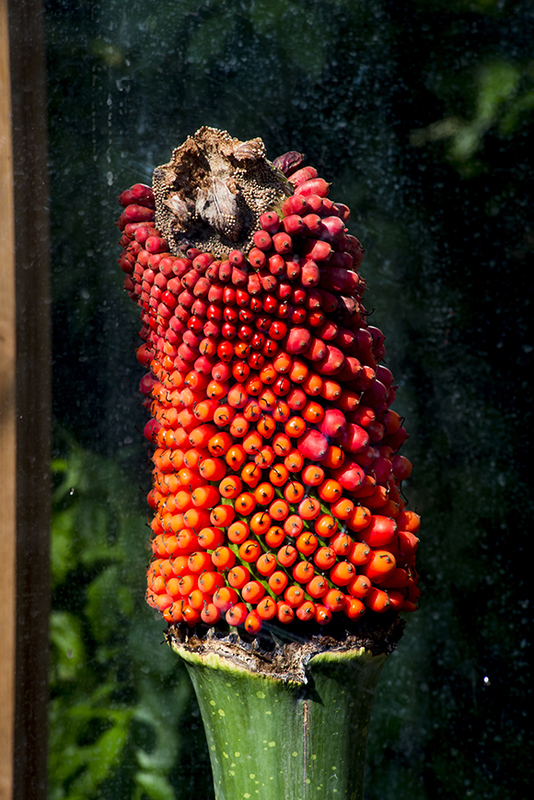 The mature fruit of Alice the Amorphophallus is now being collected for seed. 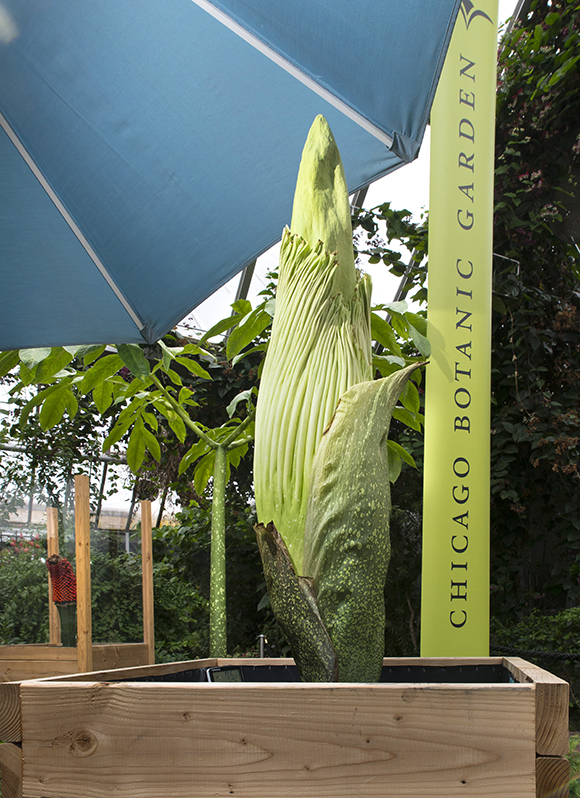 We will be announcing extended viewing hours when #CBGSprout blooms. Spring is here, however—see what else is currently in bloom.